Timothy Zahn recently sat down with StarWars.com to discuss how he went about telling the tale of pitting two of the galaxy's most feared antagonists in an all-time battle of skill and wits. Zahn, who has written several Star Wars books, maintains a close 27 year relationship with the highly intelligent military strategist and his latest success is no exception. 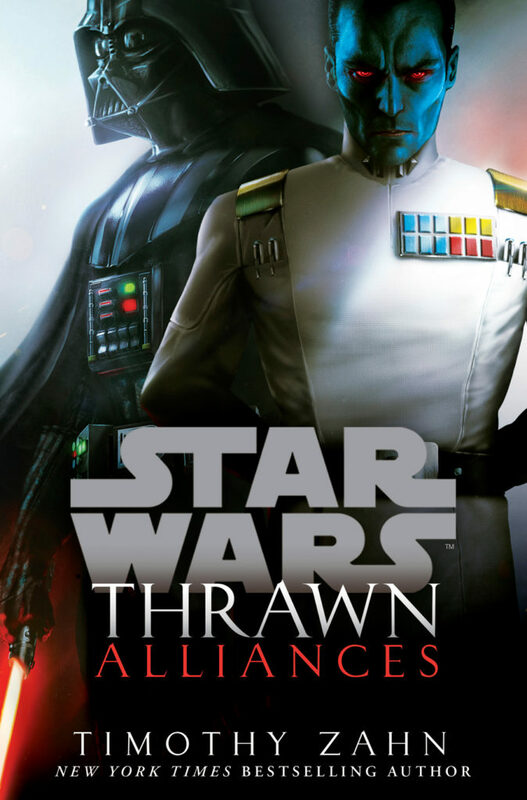 Thrawn: Alliances is the highly anticipated follow-up to Zahn's 2017 novel, "Thrawn" which served as Mitth'raw'nuruodo's introduction to the galaxy at large. This time around, we are given two timelines to follow as Zahn explores the past and present of both Thrawn and the ominous Darth Vader. In a delight to fans, the book also serves as a wonderful and intriguing side story for Padme Amidala, who can more than hold her own on the remote planet of Batuu. The interview covers a wide range of topics so if you haven't read the book yet, be warned, spoilers are ahead. StarWars.com: During their mission to discover the disturbance of the Force that the Emperor sensed, Darth Vader and Grand Admiral Thrawn try to sort out their mutual distrust, and nearly come to wrecking the mission over their differences in opinion. What do you think Vader’s frustrations regarding Thrawn are most about? Thrawn’s true loyalties, or his personality? Or their shared past? Timothy Zahn: I would say it’s a mixture. There is certainly a suspicion of whether Thrawn is truly loyal to the Emperor. There’s probably a bit of jealousy that Thrawn has come as close to the Emperor as he has, or as Vader thinks he has. How accurate that is, we don’t know. There’s certainly a bit of personality and style — Thrawn likes to play his cards close to the chest. He doesn’t like to give out partial information and so there’s a matter of wanting people to trust him. Vader’s not that good at trusting. And of course, there will be certain memories of their past together, the one mission they had — though it was successful, it was not an unqualified success. All of these things mix into it. StarWars.com: And I’m sure Vader’s not used to Thrawn, who can come off a bit condescending at times when people can’t keep up with him. Vader needs to know what’s going on. Timothy Zahn: Yeah, and at this point, both of them are used to being pretty much in control, and at the moment, neither of them is. Thrawn is constrained by his loyalty to the Emperor, while Vader is constrained in that he can’t simply off this guy if he’s being a problem because he is so clearly useful to the Emperor. So Vader has constraints on him, and I can see Thrawn’s point of view: if you give partial information, it biases people, and if you’re wrong, it’s going to be harder for people to come up with the correct explanation. For example, I will be looking for a name, and Anna [Tim’s wife] will suggest something and I will get locked onto that one and now I can’t search my memory for the real name. Similar with any kind of tactical or puzzle-box mystery. If Thrawn gives out information that is not complete, it biases everyone else, which diminishes their usefulness to him for the problem. Vader is not going to like that sort of thing, especially coming from someone who he considers not his equal, certainly not his equal in loyalty as a Sith apprentice would be to his master. StarWars.com: And what are Thrawn’s main issues with Vader? Timothy Zahn: Basically, Thrawn doesn’t have so much of an issue with Vader as Vader is not accepting Thrawn’s style and Thrawn doesn’t really want to change it. Thrawn recognizes that he is walking a tightrope: Vader may decide that Thrawn is not useful and [will kill him and] will just have to explain it to the Emperor later. At the same time, Thrawn has secrets he has to keep: the Chiss navigators, for example. Vader wants information Thrawn does not feel that Vader should have at a given time. Thrawn very much has the Sword of Damocles over his head — he knows Vader’s reputation and has to be cautious. But also he’s stubborn and doesn’t want to change his style for Vader. StarWars.com: By the end, Thrawn and Vader have figured out where they can both maximize the opportunities for a successful mission, Thrawn on the bridge, and Vader leading the troops on the ground or in their fighters. While both can inspire their forces, what marks their leadership styles as different? Timothy Zahn: Again, Darth Vader wants to be in charge. He’s got a lot of experience in combat and in leadership in general. As a Sith Lord, he has access to the Force. Thrawn is more the type to give the overall plan but leave it to trusted subordinates to fill in any gaps. Vader doesn’t really trust anybody else; Thrawn is willing to trust people. StarWars.com: And that inspires their people differently. Once you’ve earned Thrawn’s trust, you’re good. But you always have to watch out for Vader, because if you mess up, you will have clearly shown you can’t be trusted. StarWars.com: One of the ways Thrawn begins to push Vader’s buttons is how he lets Rukh meddle in the gears of Vader’s elite forces, the First Legion, accompanying the mission. How was it to get back to the character of Rukh, and how is his conflict with Commander Kimmund a parallel, or not, to the conflict between Thrawn and Darth Vader? Timothy Zahn: It’s very much the same, except that these guys are much further down in the food chain. They are reflecting the orders of their masters. Kimmund has orders: he’s got standing orders and expectations. Rukh has the same sort of thing. It’s not so much that they are in conflict, although they do have a turf war at the edge of things. Thrawn does give Vader the things he needs, a spot for his shuttle, and orders Rukh to stay off that ship. Rukh takes his responsibilities of protecting his master very seriously as well. When push comes to shove, both of these warriors recognize the other’s abilities and are able to smoothly work together. StarWars.com: Padmé ends up downed in enemy territory and helping rescue her would-be rescuers. What is it like getting into her head? How does she handle her espionage mission differently than Anakin Skywalker would? Timothy Zahn: Padmé didn’t get a lot to do in the prequel movies but they expanded her character nicely in The Clone Wars series. That was where I was keying her character off from — the ability she’s got, the whole different skill set. She has the diplomatic skills that Anakin simply doesn’t, which he could have developed, but never really wanted to or cared to. Padmé was fun — put her in a situation, and is this going to be a shooting situation, an outthink somebody situation, or is it going to be a diplomatic situation? She has all of those tools in her kit and it’s a matter of her choosing which one to bring out for this particular moment. She was a lot of fun to write. At one point, I needed to get her close to the fortress, and I run her into some people and they can bring her in. Her whole idea of “I volunteer to be kidnapped by you guys” just sounds like the type of thing that Padmé might pull off. StarWars.com: One of neat parts of Thrawn: Alliances that makes the novel worth a re-read is the revelation at the end that a local character introduced in the past storyline is also a character that goes by a different name in the present storyline. How did you go about making this character work? Timothy Zahn: The plan always was that they would encounter the same person who would have some memories so you would have a bit of foreshadowing without actually giving away anything. I wanted to put in a link between the two timelines. StarWars.com: It made it really neat to go back and re-read that character’s scenes again in the present timeline, finally knowing what has happened in the past. Timothy Zahn: That was one of the things. This character’s attitude would seem a little odd until you know what happens in the past. StarWars.com: By the end of the novel, Thrawn believes he has figured out Vader’s true identity — and that he is pretty sure that Vader knows that he knows. How far might Thrawn be willing to push that? StarWars.com: And that might be something that is tough for Thrawn to do, since he always is looking for more information to gain insight. Timothy Zahn: On the other hand, he also recognizes loyalty and respect and this is one of those situations where his love of useful information is superseded by respect of who Anakin was, and what they’ve just accomplished together. StarWars.com: Speaking of Anakin, Darth Vader has compartmentalized his own life, not even thinking of his past self as Anakin Skywalker, but as “The Jedi.” What does this say about him? Timothy Zahn: Vader doesn’t even think of himself as once having been Anakin Skywalker. Those memories are somebody else’s. We came up with the idea of “The Jedi” with a capital “The,” which also adds a nice touch to the title Return of the Jedi. But that’s kind of coincidental. Because he does not even think of himself as once having been Anakin, this is a way to distance himself from that, in his internal monologue. StarWars.com: You introduce a new menace from the Unknown Regions, the Grysks, who have found a way to exploit the Chiss method of hyperspace travel. What type of threat are the Grysks, such that they are a danger to both the Chiss and the Empire? Timothy Zahn: I’m hoping to develop more about the conflicts and threats of the Grysks with the Chiss and the Imperials in future material. StarWars.com: Thrawn believes that his actions show his loyalty to the Empire, while also benefitting the Chiss Ascendancy and possibly some internal factions within the Chiss. Is Thrawn correct in that or could Thrawn even be deceiving himself in his loyalties? Timothy Zahn: It could be. He is supremely confident that anything that is a threat to the Chiss is also a threat to the Empire and vice versa. Clearly, Vader doesn’t see it that way, and probably the Emperor doesn’t see it that way. If we continue on in this storyline, Thrawn will probably eventually have to prove it in more detail than he did in this book, with this particular battle with the Grysks. Thrawn always thinks he can figure something out, and never have to take one side or the other but always find a way to do both. There may come a time when he discovers he can’t. StarWars.com: It’s really neat seeing Anakin and Thrawn play off each other, and then later on Vader and Thrawn try to outsmart and overcome their strong distrust to sort things out. Thrawn wants to be cautious until he’s certain while Vader doesn’t want to wait. Timothy Zahn: The mood is different. With Anakin and Thrawn, they are basically thrown in and are having to react to things the whole way. Thrawn and Vader have been sent out, so they are a bit more proactive to begin with, though they wind up having to be reactive in a lot of situations. Vader, of course, has the memory of Thrawn before. He knows that the guy can be irritating, but generally, he’s a good ally. Thrawn, of course, doesn’t have that background to deal with — at least he doesn’t know it. StarWars.com: It certainly brings a much different dynamic to the way Anakin reacts to everything. He’s super concerned but he can’t show any of it. Timothy Zahn: I wanted to write a Thrawn and Anakin story, and they wanted a Thrawn and Vader story. So we compromised by doing both. It was trickier than either would have been by themselves, but I think it did pay off very well. It added layers to the reading of it but also added more layers to working on it. The advantage of fiction. StarWars.com: Yep. Being able to go back and add those extra bits like foreshadowing and setting things up. Timothy Zahn: The scary thing is when my subconscious has already done that. When I got to that last epilogue, I went back to see what Thrawn had said to Vader — saying that Anakin Skywalker is dead. “Oh, I put two very vague acceptances of that, perfect! Now is the time to make it perfectly clear.” I had not been specifically thinking about the endpoint, but my subconscious had already figured it out and put it in. StarWars.com: You always seem to be coming back from or heading out to another convention as a guest author — you probably have more than 10 coming up from now until spring 2019. How do you wrap time for writing around such a full convention appearance schedule? Timothy Zahn: I get a lot done on airplanes. I can generally work on my laptop reasonably well. It does get to be stressful sometimes. StarWars.com: You’re constantly switching between the book you’re writing and the book you’re talking about at conventions. Timothy Zahn: I talk about being an author at conventions and when I leave, I become the writer. The author has written stuff, the writer is still supposed to be writing stuff. Kind of a different hat, or at least a different flavor of hat. StarWars.com: Are these “The Author” with a capital “The” and “The Writer” with a capital “The” like “The Jedi”? StarWars.com: Do they get along? Timothy Zahn: Pretty much, yes. They do mix memories just fine.